Slow dining is a grand concept but actually making it happen can be hard to wangle when everybody is rushing off to various meetings and engagements. Sadly, once the habit of leisurely dining is lost, it can be difficult to recreate. To encourage lingering, serve dinner in courses. Attractively presented individual portions seem festive, as do candlelight and flowers. Wondering what to make? Something simple, of course, so we can concentrate on congenial company. 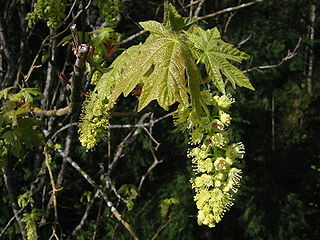 Why not celebrate spring with a salad based on Bigleaf maple blossoms? The delicately honey-flavored flowers are also delicious sprinkled over vanilla ice cream with a few shreds of candied ginger. When the maple flowers are gone, you might substitute rose petals or nasturtium or squash blossoms. Always use organically grown edible flowers (without toxic pesticide residues). * Remove the fuzzy bits at the center of each blossom to eliminate pollen, a possible allergen. Gently toss greens and divide between four dinner plates. In a wide, shallow pan, cook oil and garlic over medium high heat for 2 minutes. Add onion, pepper, and salt, cover and cook, stirring, until barely soft (2-3 minutes). Stir in scallops, cover pan and cook for 2 minutes. Stir in maple syrup and pepper, cover pan and cook until opaque (2-3 minutes). Spoon over greens and serve warm, garnished with flowers. Serves four. Grade B maple syrup is cheaper than the paler Grade A and has a fuller, rougher, more robust flavor. It’s terrific in dressings and sauces and can replace honey in many recipes. Rice oil is almost flavorless and really lets other ingredients shine. In a bowl, whisk oil, vinegar and soy sauce together, then add maple syrup to taste. Refrigerate leftovers for up to 1 week. Makes about 1/2 cup. Here’s another spritely spring dish; Beautiful Beet Salad, lively with fresh mint and tart-sweet CaraCara oranges, which are extra rich in flavor as well as in carotene and other phytonutrients. Combine beets, orange rind, mint and soy sauce, set aside. With a sharp knife, slice all white rind off orange, dice the fruit and add to beets along with any juice. Toss gently and serve. Serves four. This made-in-minutes dish is lovely on both plate and palate. I make it with Bob’s Mill unsweetened coconut, which comes in generously wide, curling shavings. Coconut milk and oil provide healthy fats and a pleasant feeling of satiety, so a little goes a long way. Preheat oven to 350 degrees F. Arrange coconut Lon a baking sheet and bake until golden (6-8 minutes), set aside. In a soup pot, combine onion, fennel, and pepper, orange juice and rind, salt and garam masala. Cover pan and bring to a simmer over medium high heat. Add broth and bring to a simmer. Add salmon and cook until opaque (2-3 minutes). Add coconut milk, bring to a simmer and cook, uncovered for 5 minutes. Serve hot, garnished with coconut curls. Serves 4-6. In any season, Fresh Mushroom Soup is a quick and delicious treat. It features baby Portobello mushrooms (often sold as Criminis), shallots, and spicy-hot daikon radish sprouts. Remove mushroom stems, trim cut ends and chop. Slice mushrooms caps thinly, set aside. In a saucepan, combine oil and butter over medium high heat until melted. Add shallots, mushroom stems, and half the salt and cook until soft (2-3 minutes). Add sliced mushrooms and remaining salt, stir to coat, cover pan and cook over medium low heat until soft (8-10 minutes). Stir in flour, cover pan and cook for 2 minutes. Stir in broth 1 cup at a time, bring to a simmer and cook, uncovered, over low heat for 5 minutes. Season with pepper and serve, garnished with daikon sprouts. Serves four. This entry was posted in Nutrition, Recipes, Sustainable Living and tagged Beautiful Beet Salad, Bigleaf Maple Salad With Scallops And Maple Dressing, Curried Salmon Stew With Coconut Curls, Fresh Mushroom Soup, Maple Dressing. Bookmark the permalink. Bigleaf maple blossoms are also yummy stirred into an omelette. I learned about the edibility of these flowers in a wildcrafting/herb class years ago. Our instructor cautioned us to always try a little bit of any new wild food before diving in and eating a lot of it right off. Most of us have pretty wimpy digestive systems, after a lifetime of eating domesticated crops — not to mention prefab and emasculated ‘food’ created by our food ‘industry’. Wild foods have so much more vital life force energy in them that they can cause digestive excitement in some people. Yes, and some folks have pollen allergies that can make edible flowers less appealing. I also think that home grown and locally grown food, picked fresh, is more potent than the tired store-bought produce many folks are used to eating. The flavor is different and the nutrients are at their peak, which makes fresh foods far more valuable in our daily diets. To me, it seems wise to enjoy something freshly picked at least daily of not at every meal.